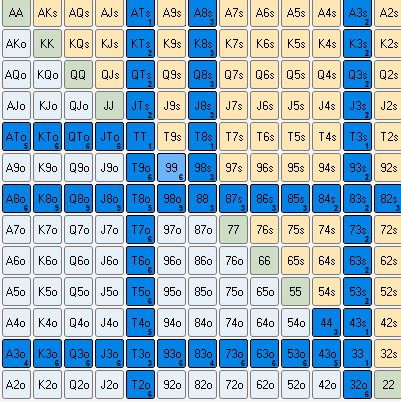 You are here: Home / Forums / Main Poker Forum / Poker Strategy / NL 6-max (stakes: NL20+) / NL20, TPTK, BUvMP, Triple barrel vs fish playing whole deck? The reasonI flatted is mostly BB and no squeezer behind. And PFR 4bets a ton. Q1: Can we triple barrel big TPTK? A1: Villain plays the deck, therefore he has all the 3x. We need over 50% for a valuebet. If he calls all 8x down, then we have 57%. We definitely have a valuebet if he calls 8x down. BE point is if he calls Q8 and better. I think a fish that large could maybe even call down 77 and 66 there too? since there were no OCs OTT and OTR and all the draws busted I wouldnt put it past them to bluffcatch pretty light there. Maybe even spaz with some random A high occasionally. IDK. I would triple barrel on this runout as well.